I quote this piece at length — 12 years later, when neither Updike nor Wallace is still with us — because it manages to anticipate with uncanny precision my own mixed reactions to Middlebury professor Robert Cohen’s latest novel, Amateur Barbarians. It sheds light on some of the themes of that work, too. Cohen devotes so many pages and so many beautifully wrought sentences to exploring the mind of a “magnificent narcissist” — protagonist Teddy Hastings, a small-town middle-school principal in the throes of a midlife crisis — that he makes it clear the species is far from extinct. But by giving (roughly) equal space to a younger character who seems designed to represent Wallace’s irony-addicted, noncommittal generation, he also crafts a built-in rebuttal to the familiar critique. Most readers will know whether they want to finish the book by the end of the first chapter, which takes 19 pages to detail the thoughts that afflict Teddy Hastings during his morning workout. Fifty-three years old, just a year past losing his younger brother to melanoma, he can’t ignore the intimations of mortality. He’s on sabbatical from his job and fresh from a stint in the local jail, for reasons Cohen slowly unveils over the ensuing chapters. At his age a man shifts his focus, from the romance of building to the hard facts of maintaining. The building has all been done. Even if the nails are bent or mutilated and nothing is quite level or plumb or square. The building has been done; no room for more unless you tear something down. And he had no desire to tear things down. The hard thing was to keep them aloft. The tearing down came anyway; no need to contribute to that. Yet in the end one always did, it seemed. This passage illustrates Cohen’s consummate control of his prose: the singing repetitions of phrase that echo the circularity of Teddy’s preoccupations; the bone-dry humor — and foreshadowing — of the last line. But it also illustrates Teddy’s magnificent narcissism; his inability to see beyond his own dilemmas. Does every man of a certain age really have a “building” to maintain, whether in a metaphorical or a literal sense? What about the failures, the names on foreclosed mortgages, the people who couldn’t even get their hands on a hammer and nails? Then there’s the character Cohen has designed as Teddy’s opposite, 33-year-old Oren Pierce, who steps into Teddy’s job — and, later, his lonely wife’s bed — in his absence. Oren is equally a product of American affluence, but he has no “building,” or even a foundation, to show for his relatively charmed existence. So the thinker and the doer switch places: Teddy, who’s been toiling all his life, stops to ask Why? while Oren, who’s never felt obliged to do much of anything, experiments with bourgeois drudgery at the middle school. The problem is that, while the two men’s problems differ, their voices, as conveyed in Cohen’s leisurely, erudite, third-person prose, sound remarkably the same. The book noticeably lightens up only in a chapter told from the point of view of Teddy’s teenage daughter, Mimi. But to Cohen, the difference between the generations seems to matter a good deal. Like the archetypal thirtysomething described by Wallace, Oren is horrified of self-absorption and solipsism and anomie; he’s eager to find someone he can love more than himself. But — and perhaps this is the third-act twist Wallace didn’t mention — he fails, because solipsism and self-absorption and anomie are in his bones. He no sooner gains an object of his desire, such as Teddy’s arch and distant wife, Gail, than he finds the desire receding. While Cohen pokes fun at Teddy’s reckless impulses and overweening pretensions throughout the book, it’s difficult to escape his conclusion: The middle-aged boor has a constructive (and sometimes destructive) forcefulness that doesn’t seem to be in the sensitive young dude’s DNA. Teddy’s building may be leaning, but at least he’s built something. That’s not to imply the novel needs a female perspective, per se — women are no slouches when it comes to solipsism. And many of the insights that emerge from Teddy’s soul-searching are meaningful to any reader, particularly when Cohen unsentimentally describes the experience of watching a brother die and knowing the old sibling rivalries will remain forever unresolved. No, it’s generally not the ruminations themselves but their sheer weight and volume that made me want to escape from the thudding rhythm of Me me! Me me! in this accomplished novel. Amateur Barbarians imparts indelible images. (The long description of Teddy watching his daughter sleep on a summer afternoon combines innocence and eroticism like a Rousseau painting.) But the novel also, wonder of wonders, makes me almost grateful for our current hard times. Because, when you’re scrambling to keep a roof over your head, there’s not a lot of time to worry about the creaks in the walls and rumbles of the plumbing. Like the aristocratic heroes of those old Gide and Bowles novels, Teddy has to wander deep into the desert to regain the alert leanness of the predator; to experience life in all its intoxicating “particularity.” Perhaps bad luck and bad credit will make seasoned barbarians of us all. 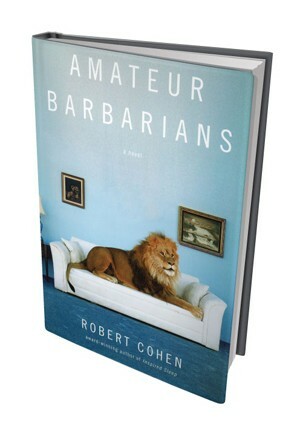 Amateur Barbarians by Robert Cohen. Scribner, 401 pages. $27. Robert Cohen reads from Amateur Barbarians in Misty Valley Books’ Vermont Voices 2009 series on Sunday, November 22, at 2 p.m., at the First Universalist Church in Chester’s Stone Village. Free. Info, 875-3400.